I've casually collected Moose's Trash Pack toy line since it first came out, occasionally picking up a pack but never attempting to put together any full series. 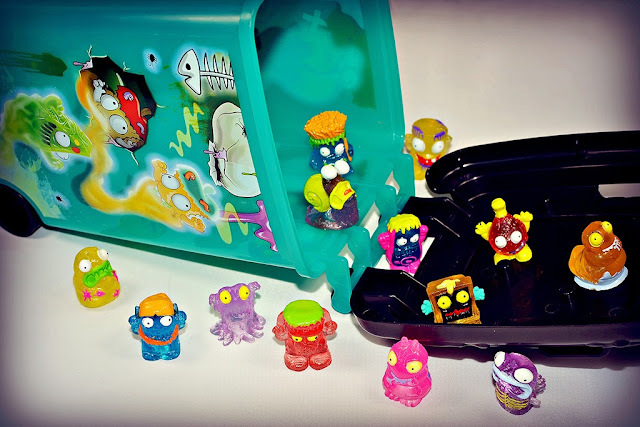 It's always cool to see a popular line of mini figures on the shelves--especially if it's monster-related--but overall I've found the Trashies a bit too cute or cartoonish for my tastes, even though I think certain ones are pretty great. So, I decided recently I wasn't going to buy any more and just stick with what I already have. I failed at that plan. Hard. I probably wouldn't have, if it weren't for the Trash Pack Gross Ghosts. Gross Ghosts is a special "Mystery Series" of Trashies exclusive to Target stores, taking select popular Trashies from past series and resurrecting them in new, clear colors along with translucent aqua-colored garbage cans. Which for some reason makes them about 10 times cooler to me. So I bought a pack. Or four. They were just too cool to ignore. Somehow the new transparent colors really make the Trashies scream "Buy us, you fool!" extra loud from the toy aisle. 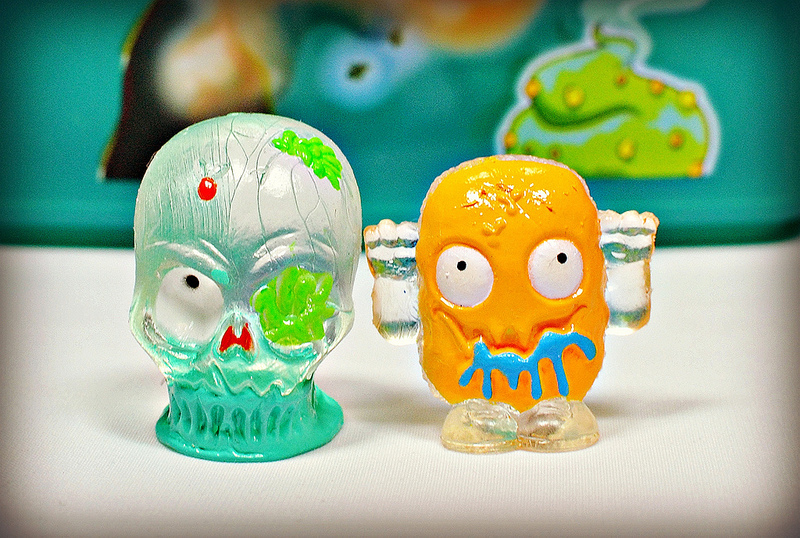 Seriously, how cool is that "Skummy Skull" figure!? 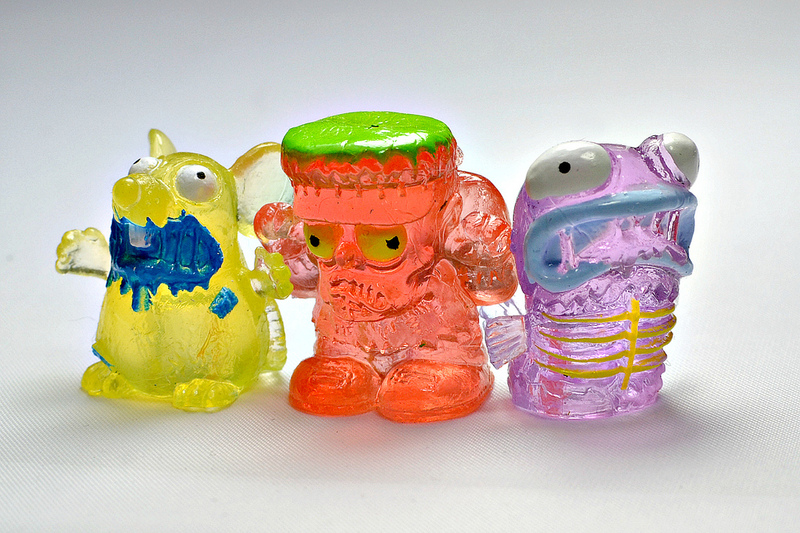 There are a handful of base transparent colors for the Gross Ghosts, including pink, blue, orange, red, purple and yellow. There's also crystal clear, as shown with the Wheelie Bin exclusives above. In addition to being clear, some of them glow in the dark. 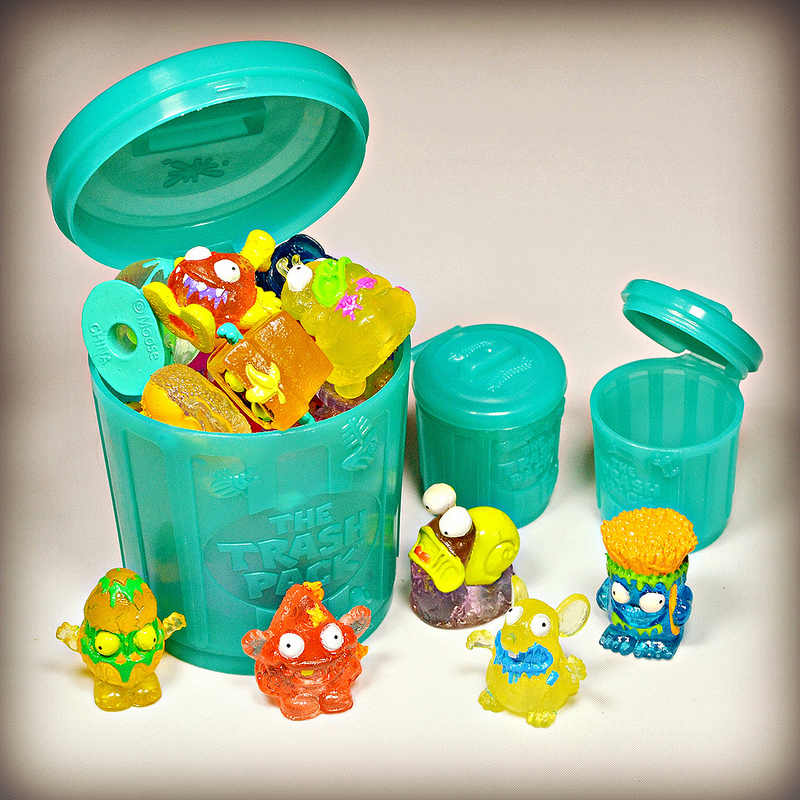 These are the "Bin-Fections," the 10 ultra rare figures from the set. Although there are 62 standard Trashies making up the Gross Ghosts, it is thought that 12 of the characters on the checklist haven't made it to stores yet (see this thread at LittleRubberGuys.com for more on that). That makes sense, as they are some I haven't spotted yet in all the packs I've come across at different Targets. It seems this series is geared toward Halloween even though they first appeared this Summer, so I'd imagine we'll see the remaining 12 released in the coming weeks, closer to Fall. They're depicted on the checklist in green and turquoise colors, which are different from the colors of the 50 sculpts already released. 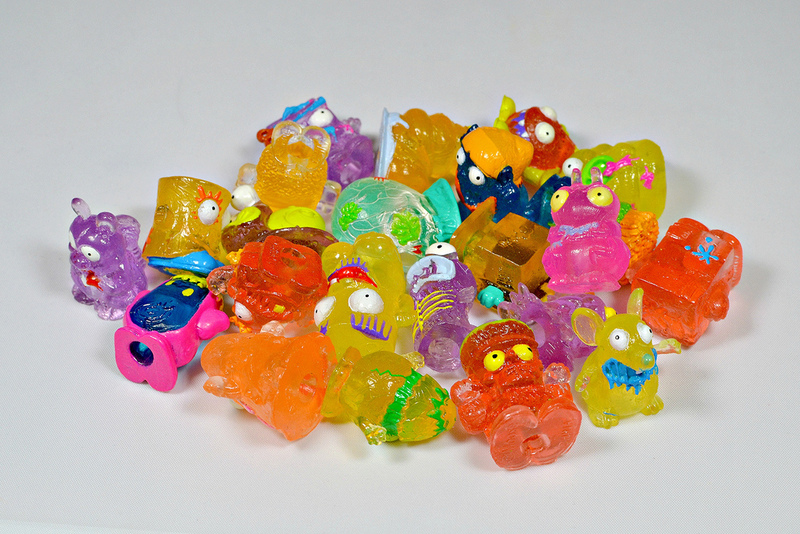 I think re-releasing certain Trashies in eye-catching clear colors as "ghosts" as if bringing them back from the dead was a pretty genius idea, and it's safe to say I haven't bought my last pack yet. So far, my favorite has got to be the red Rankenstein figure (in the middle of the first photo in this post). It doesn't get much better than that dude. What about you? Have you seen the Gross Ghosts yet? Will you be picking any up? I'm lucky I live in Melbourne where these things are made, I had a look yesterday at their line and was shocked at how many series they've made already. I didn't see these guys, but I saw the new trash wheels! Yeah! Do you guys have Target stores over there? Over here the Gross Ghosts are Target exclusives. Yep, that's where I saw the biggest displays, also Kmart and toy kingdom have them. Maybe the trash wheels are target exclusives too? Ah, okay. Not sure about the Trash Wheels being exclusives, although I don't think I've seen them anywhere besides Target yet. Man I love these things! I am a pretty devoted Trash Pack collector, but these ones have a little something extra special to them. They kinda remind me of those little ghosts that would come with the old Ghostbusters figures. I'll be trying to get as many characters as I can, but so far my faves are looking like Scummy Skull and Smelly Fish. Smelly Fish already looked pretty dead, so he suits the ghost-look well, and who doesn't want a ghost skull figure? Smelly Fish and Scummy Skull are two of my favorites as well! I've been trying to get as many characters as I can too. I'm winding up with quite a few doubles though. Yeah, that's just part and parcel of collecting the Trash Pack I guess. Luckily I have a nephew to pawn my doubles off on, but even still, I have a big zip-lock bag of extras I need to get rid of. Maybe eBay. Someday. If you wind up with doubles of the Gross Ghosts, let me know. Maybe we could trade.